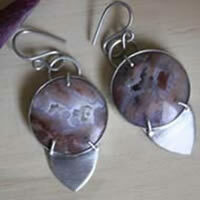 Youngite is a mix of jasper and microcrystalline druzy quartzes. It is a rare stone that you can mainly find in the state of Wyoming in the USA. The hues of this stone can vary from pink to beige. It is slightly fluorescent when put under ultraviolet because its light radioactivity that is due to its uranium. However, it is a harmless dosis for man. It’s been known for a long time by the Amerindian shamans who used to use it for their trances. It has the same properties than the same minerals it is made of: jasper and quartz. the youngite would be useful against stress in general. It would cure problems linked with the brain, lungs, the large intestine, the blood system, the nervous system, the spleen and the gout.